The art of observing beetles, or perhaps any group of wild animals, takes time to master but will, if developed carefully, provide a deep understanding of the environment we share with so many other forms of life. Such an esoteric achievement does not, however, come easily. One of our very keen thirteen year old junior members has joined us on countless recording forays both locally and further afield as well as attending numerous nocturnal meetings using just about every kind of light trap and bait and recording method available and slowly, very slowly, his awareness of the environment and knack of being able to find specimens has developed to the point where guidence is rarely necessary. Nowadays when we visit a new area he makes up his own mind about where to look or what to sample and, generally, the results are what would be expected from a competent amateur biologist. But this kind of thing takes time, even with the most patient and passionate nurturing, maybe hundreds of hours of fieldwork and labwork and reading. It is difficult to explain where a good place to dip a pond net might be or which logs are worth looking under or which fungi are worth sampling, this kind of thing can only come with guidance and a considerable amount of trial and error. On the other hand it can be hugely satisfying to the right kind of enquiring mind and of course exciting when something unusual turns up. Such experience is quickly built upon and never forgotten. While out rambling along the local rivers it becomes impossible not to stop and examine very carefully the Brooklime or Mint or Hogweed in the hope of finding something interesting, to sit for a while and scrutinize the stems and turn a few leaves is not a bad way for a coleopterist to behave and of course many other kinds of plants will be examined in the process. This kind of behaviour will maintain an awareness of the local flora which every coleopterist should take the trouble to learn. The point being that it must be realised that observing coleoptera in the wild is a learning process; using the same tecniques over and over will simply produce the same species over and over until finding something unusual becomes very rare and the whole process becomes boring. It most assuredly need not come to that. Uloma Being aware of the possibilities is very important. Out in the local parks it is very pleasant to sit and observe Phalacrids and Nitidulids and the various weevils that occur in large numbers on just about any yellow flower in the spring and summer during warm weather, but not quite the same thing stopping to look at the Convolvulus flowers around Tesco's carpark or the Narcissi around St.Mary's church on a busy saturday morning, but in each case specimens are present and what's more they are usually different to those in the park. Likewise the Phalacrids found in town centre gardens tend to be different from those in the parks. Many beetles will be found simply by looking at flowers and with some groups eg. Cerambycids and Oedemerids this really is the best way to find them as large areas can be searched quickly again and again, one could never hope to sample such areas as quickly by any other method. During warm weather many species will be conspicuous; Carabids and Staphs will be seen on pathways, Coccinellids and Chrysomelids will be seen generally and Pyrochroids and a whole host of other species can hardly be missed on umbels. Waterside vegetation will harbour many Chrysomelids among others, and the flowers of Carex, Juncus and Phragmites should be looked at for Kateretids, on the ground beneath a different range of species will be found, especially Carabids and Staphs but also Heterocerus and Dryops among many others. Look in the same places at night and many, many specimens may be active, searching tree trunks may well produce Dorcus and in this way only a few years ago Lucanus was a common find throughout west London. On several occasions we have been surprised to see Blaps on the walls outside Watford market both nocturnally and diurnally. 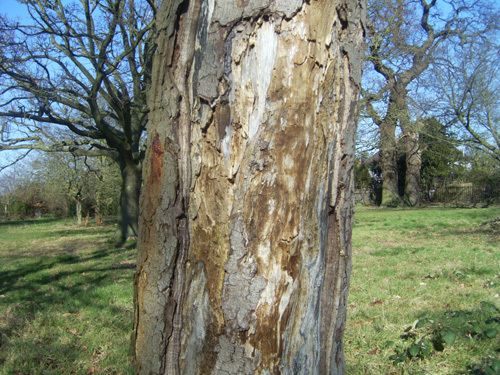 Uloma was found in Cassiobury park by torchlight. Many beetles will fly into illuminated rooms at night and these are often species otherwise difficult to find eg. Dermestidae, Aderidae, tenebrionidae and Anobiidae. Bradycellus spp. and Trechus spp., along with a whole host of other beetles are attracted to garden lights and when these are mounted on or near a white surface they may be seen in large numbers. looking around the fruiting bodies of fungi at night can be productive, searching around decomposing terrestrial bracket fungi may, as we have found on several occasions, reveal Staphylinids by the thousand. When passing trees and shrubs, especially along woodland borders, it is good to develop the habit of observing the contours of the plants as beetles often swarm around these, some chafers do this eg. Melolontha and Amphimallon but also Staphs eg. Oxytelus and Anotylus, often in large numbers. See Tillus and Ptilinus. Other species eg. Hoplia (diurnal) and Serica (nocturnal) swarm above long grass and are easily observed by the alert naturalist. After some experience has been gained in the art of observing coleoptera in the wild it becomes obvious that some species behave in characteristic and predictable ways eg. Prionychus, any such behavioural traits should be recorded under the general heading of Ethology which deals with natural behaviour, a glance through the literature will show that there is much to be learned. 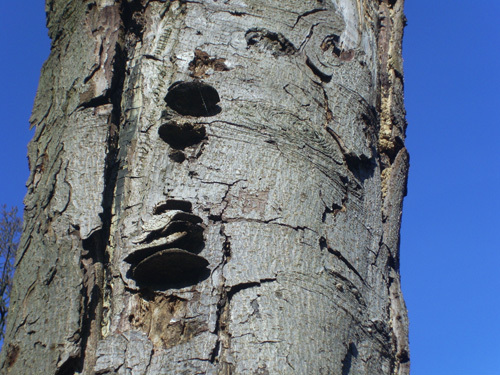 Similarly any species of plant or fungi found hosting a beetle should be recorded, although identifying fungi is not always straightforward and here a photographic record will be valuabe, this can sometimes help with beetle identification eg. Chrysomelids and curculionids and may add to our knowledge should an unusual host be found. Specimens found mating or gravid females or adults alongside larvae should be recorded, more especially in these days of supposed climate change, if temperatures and/or seasons are changing we may see more broods or an extension to a species breeding season, without data from the wild these kind of things cannot be known. Agrilus Initially there can be a feeling of pointlessness to all this observing and recording, that whatever we record will have been seen and recorded before, but be assured that nothing is further from the truth. New county records appear each year (Agrilus), new species appear on the British list each year and, with 'global warming' combined with our proximity to the continent, this is likely to accellerate. Species considered extremely rare or possibly extinct may turn up (Uloma) and occasioally, very occasioally, species new to science are found. Beetles have always been imported accidentally into the U.K. with eg. 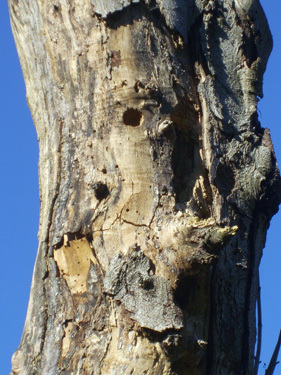 foodstuffs or timber and sometimes these become established in the wild (Euophryum) or remain as synantropes or pests but the majority , faced with a different climate, do not. Global warming may change all that. Careful recording will, in the long term, teach another important aspect of observation, namely observing what is not there. The majority of species have years of abundance and this is exemplified by the Cockchafer, studies of the population dynamics of various species show some of the factors that influence this eg. food supply, predation or parasitism but there may be other factors suggested by careful observation that may not be so obvious. The spring of 2007 was bizarre; march and april were hot and beetles were everywhere, may turned cold and wet and this continued through june which meant lots of trees being blown over in gales and of course coleopterists love that sort of thing as they rarely, if ever, carry ladders. But more careful observation demonstrated something unusual; many species were increasing in abundance through april, notably many Chrysomelids eg. Donacia semicuprea, Phaedon cochleareae and Lochmaea crataegi, but then came may and the rain and for the first time in our many years of observing beetles these were more or less absent during the summer. Galerucella spp., generally so common locally, were likewise very rare. No doubt there will be implications for 2008, only careful observation and recording will tell. The point made earlier about taking the trouble to learn the local flora applies equally, and I am among those who would argue more so from a coleopterist's point of view, to local fungi. Being able to find and identify fungi will add greatly to ones knowledge of the local coleoptera. Again it is simply a case of visiting likely sites, observing and gaining experience and, unlike coleoptera, fungi will stay still while you try to identify them. Some species will need to be brought home for identification and some cannot be identified without specialist help but there are lots of books and people and groups dedicated to studying fungi so it is worth exploring. Again this can be very frustrating; glancing through Alexander's annoyingly comprehensive (and very good) book might give the impression that most fungi- coleoptera associations are understood but press on, there is much to be discovered. At first it is natural to notice and examine large fruiting bodies that may be found all year round but are generally more common in the autumn, and this is fair enough as many specimens will be found and it can be a very satisfying way to carry on. 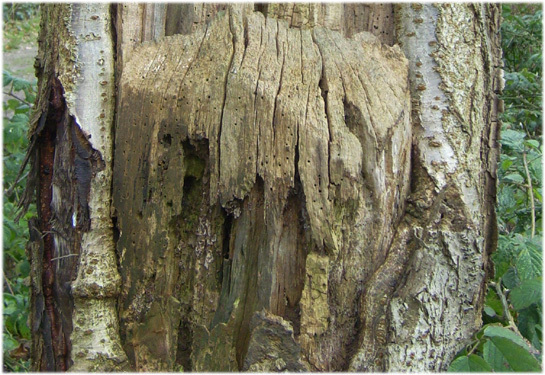 But look a little closer at dead logs and timber in general and many species of fungi will be found, look very closely and they will be found to be hosting many beetles eg. Ciids, Staphs, Erotylids and Silvanids etc.,etc. Such species might be observed in the field but to be fully appreciated there are some very powerful tecniques we can use to find them, more of this later. This discussion on observing coleoptera is being kept deliberately brief because we intend to expand upon it under our descriptions of local species but we will now quickly cover a few more aspects of observing and recording beetles which ought to be considered before work begins. The question regarding where to record beetles is a difficult one. We are unashamedly parochial in our recording, hence the WCG, but there are advantages and disadvantages to this. When one becomes interested in entomology it is generally the same thing as becoming obsessed with it, insects are powerfully fascinating and stimulate the mind just so, the effect being that we sit down and read about ever more interesting and impressive species. This sort of thing has lead to many field trips with the children to all sorts of remote places so that they could see eg.Tiger beetles, Stag beetles, Dytiscus, Prionus etc., etc., and this sort of behaviour can, unless one is very careful, lead to the situation where the whole point of going out is to collect specimens rather than record them. This can produce impressive collections of specimens but that is really not our business. Such behaviour has sometimes been accidentally beneficial in the sense that many collections have ended up in museums and so we may nowadays have long series of very rare but historically common species. It still goes on. Because of the relative scarcity of coleopterists much of the country is remote from their attentions and if we were not prepared to travel much of our enviromnent would be,in coleoptera terms, a wilderness. In this sense it can be a good thing to travel, similarly visiting out of the way places for educational reasons can be beneficial. But there are circumstances where it is a very bad thing indeed; the various scientific journals devoted to entomology feature papers and articles written in good faith, intended either for the education of others or to add to our knowledge or to further research and this is a good system because it keeps us up to date with our interests. But when something interesting or unusual is reported along with its provenance we sometimes see further articles informing us that somebody else has been to the same place and found the same unusual species. This happened recently with a rare ground beetle in west London and, while it is good to hear of rare species occuring locally and might prompt us to search for it in other places, it left us feeling that it might have been better not to have reported so much detail in the first place; the dot is already on the map so why not leave the things alone? In general the question of where to record beetles is a difficult one but there are many good reasons to record your local fauna, not to the exclusion of all else because as we have seen it can be a good thing to travel, but with your local fauna you can spend time applying various recording methods and easily follow up projects like pitfalling or light trapping on a frequent basis. The production of a local list for posterity is one of the most valuable things the amateur naturalist can do, more especially with groups like coleoptera because such things, except for historically notable sites, are not common. Once the stage of serious recording has begun there will be an incredibe number of specimens brought home for examination and the vast majority of these will need to be released afterwards, here the advantage of local work is obvious. Under our descriptions in the 'Species List' we have included some of our own observations of the species from our local experiences but in order to try to make this site useful we have kept these brief so that we can cover more of our list, on the other hand this medium is ideal for adding stuff and expanding on what we have written and we intend to do this as time goes on. We are perfectly willing to add observations from other interested parties in order to make the site more appealing. The advantage of this is that seemingly trivial things can be discussed and perhaps developed into something worth a note in a journal. Coleopterists see the world in a unique way, like other naturalists but a bit different; a Lepidopterist will understand feeding signs and spot a Psychid case at half a mile, a coleopterist will do the same with rolled up Fagus leaves or fungi, a flash of green above a woodland path will suggest a Tiger beetle, wood ants nests near Hawthorne and Oak will suggest Clytra, the list is endless. So what does one gain from all this activity? Satisfaction certainly, knowledge, intellectual stimulation and the chance to meet likeminded people. Coleopterists are in general quite sociable and willing to give of their time and experience. Also something that is difficult to describe; read about the history of the subject and realise that you are becoming a part of it by making a contribution. Modern perceptions of entomology have changed; nowadays, especially with the internet, it is much more accessible, the expense involved is small when compared with most modern passtimes and the literature is becoming much easier to use eg. compare the Royal Society Handbooks for the Carabidae from 1974 (Lindroth) and 2007(Luff) or Crowson's key to families with that of Unwin. Such things will become obvious once a serious interest begins. Observations thus form the basis of some of the aspects of studying coleoptera, some will be of beetles, some will be of plants, fungi and other habitats and some will suggest useful work that might be carried out in the future. There are many other aspects of the subject to persue but for the moment when we become adept at observing coleoptera it will occur to us that there might be a few clever ways to extract beetles from their environment so that we might observe them more closely. There are, and we will discuss some of these below.